The Austin Marathon weekend is upon us. It's time to put all of that hard training to the test this Sunday, February 15. With this in mind, Allan Besselink will be doing a RunSmart open question and answer session at RunTex (422 Riverside Drive) at 11:00 am on Saturday, February 14. 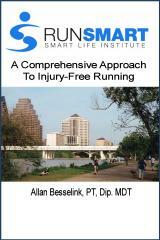 Allan will have copies of his book "RunSmart: A Comprehensive Approach To Injury-Free Running" available for purchase. Stop by on your way to or from the marathon expo ... and remember - "RunSmart" is a great Valentine's Day gift for your sweetie, or a fine memento of your trip to Austin for the marathon! Good luck to everyone that is running this weekend.